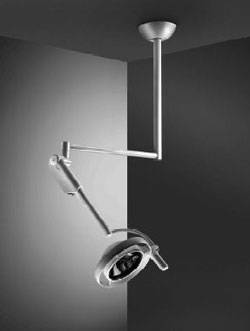 What type of light is considered the best in surgical lights for operating rooms as well as patient examination rooms? In an operating theatre it is essential that true light be available to allow medical staff and surgeons to notice even minor differences in color. This means that a pure white light is the most desirable. It is critical for clear contrast and ease of color tone differentiation that blue hues are eliminated from the light source. In addition to the bulb type, it is important to consider bulb longevity when selecting a light style and design. Many of the new LED and halogen bulbs provide extended operating life that saves both money as well as downtime for replacement. With multi-bulb systems in the lights there is also no need for a back-up light on site since it is not a single or dual bulb unit. The design of the light itself can also be instrumental in determining just how practical it is. 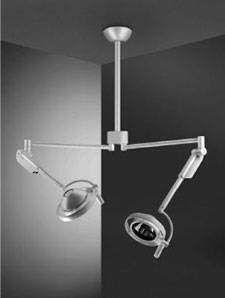 Operating room lights that are designed to limit shadows through the use of reflectors, limitless rotation and positioning options as well as shapes that position the bulbs strategically in the light all are essential for direct, focused light. What is the advantage of surgical lights that use LED technology? LED surgical lights are considered to be superior in many respects to other types of operating room lights. They are very true white and can provide up to 10% more illumination than other types of bulbs. Since they are LED technology they also produce no heat either downwards with the light or venting out of the fixture. This means that there is no concern with patient or staff comfort when working for long periods of time directly under the light source. LED operating room lights are designed to be energy efficient and, depending on the specific fixture, can save as much as 50% over traditional surgical lights in hospital settings. For busy operating rooms and surgical areas that are in use round the clock this can be a huge electricity saving feature. Typically LED lights have a longer bulb life as well, reducing the cost of replacement bulbs over the life of the light. Lights designed with energy saving in mind can extend the very bright and true white light from the LED bulb with the use of reflectors. These are faceted surfaces around the bulb that enhance the light source from different angles from the same bulb. This provides a reduction in shadows but also allows for greater focus of the light beam directly on the required area. What design options are available in surgical lights for high volume operating theatres? Busy operating theatres where a wide number of procedures are completed on a daily basis need to have lights that are practical in their design. This includes having a good range of motion from the arms of either a single or double mount option. Operating lights with a double mount provide two distinct light sources and directions to enhance visibility over a wider area when necessary. They can also be used to cut down on any possibility of shadows. These lights may also be most practical for multi-use facilities since the dual lights are ideal for illuminating the entire patient as well as specific areas of focus. It is important in all types of surgical theatres to consider surgical lights with drift-free technology. This prohibits the natural movement of the light that can occur with movement in the room. Drift-free lights may be designed with a counterweight that anchors the light in position until manually repositioned. Light on and off switches that are mounted on the walls will eliminate the need to actually touch the handles of the controls ensuring that the light stays in one place.